NASA’s Opportunity rover has been exploring Mars for more than 10 years now, but the space agency says the robot is experiencing memory and data loss which they hope an upcoming hack will solve. 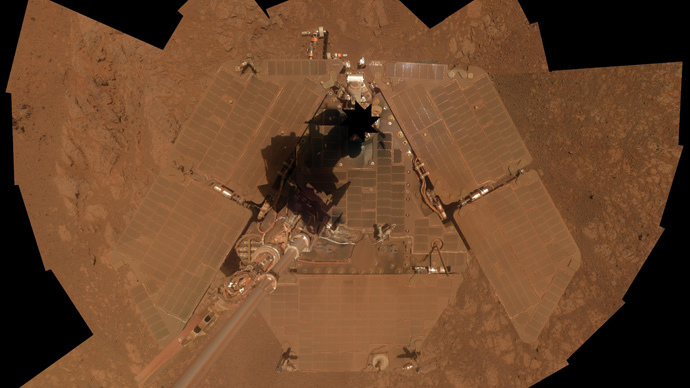 NASA recently described Opportunity’s problems as “persistent computer resets and ‘amnesia’ events,” specifically pointing to issues that are occurring when the robot tries to save data on its flash memory storage system. As a result, the robot has resorted to saving data by bypassing its flash memory and storing it on its random-access memory, RAM. The Opportunity team thinks an age-related fault is primarily affecting the flash memory of one of the robot’s seven memory banks. While the mission can continue, the team’s plan is to make the flash memory usable again by tricking the six-wheeled, 400lb rover into thinking it has six memory banks instead of seven. "So now we're having these events we call 'amnesia,’" Callas explained to Discovery News. "Which is the rover trying to use the flash memory, but it wasn't able to, so instead it uses the RAM... it stores telemetry data in that volatile memory, but when the rover goes to sleep and wakes up again, all [the data] is gone. So that's why we call it amnesia - it forgets what it has done." NASA says the memory issue is causing the rover to reset itself, and in some cases it stops communicating with mission control altogether. "It's like you have an aging parent, that is otherwise in good health - maybe they go for a little jog every day, play tennis each day - but you never know, they could have a massive stroke right in the middle of the night," John Callas added to Discovery News. "So we're always cautious that something could happen." In an attempt to solve the problem, the NASA team is attempting to "hack" the rover's software so that it ignores the faulty part of its flash memory and instead writes, permanently, to the healthy hardware. The process will take a couple of weeks, but Callas said the rover is aging and it could be nearing the end of its life. NASA’s Mars Exploration Rover Project landed twin rovers Spirit and Opportunity on Mars in early 2004 for missions planned to last three months, but both rovers kept going far beyond their expiration dates. Spirit worked for six years and Opportunity is still active a decade later. The rover has covered 26 miles (41.8km) of Mars’ surface and sent back vital intelligence on the planet’s ecology, including data about ancient wet environments. The project is one element of NASA’s preparations for a human mission to the planet in the 2030s.